Aside from a gorgeous room, one of the best parts of being on vacation is taking a break from the culinary norm and enjoying the local flavor of the area. This can set you back a pretty penny if you’re planning to eat out every meal, but Key West has a full range of dining options with not only gourmet venues but great eats at great prices. Supercharge your morning with your favorite Starbucks drink and grab a pastry or juice on the side. Whether you plan to set off on an adventure or just spend the day at the beach, you can get your Starbucks fix right at 24 North. 3820 North Roosevelt Blvd. Look forward to Latin flavors at Bien, serving tender pork and chicken, black beans, rice, sandwiches, grilled corn and tasty salads. Portions are large enough to share certain items. This is an unassuming dining space with outstanding food at fair prices. Muy bien! 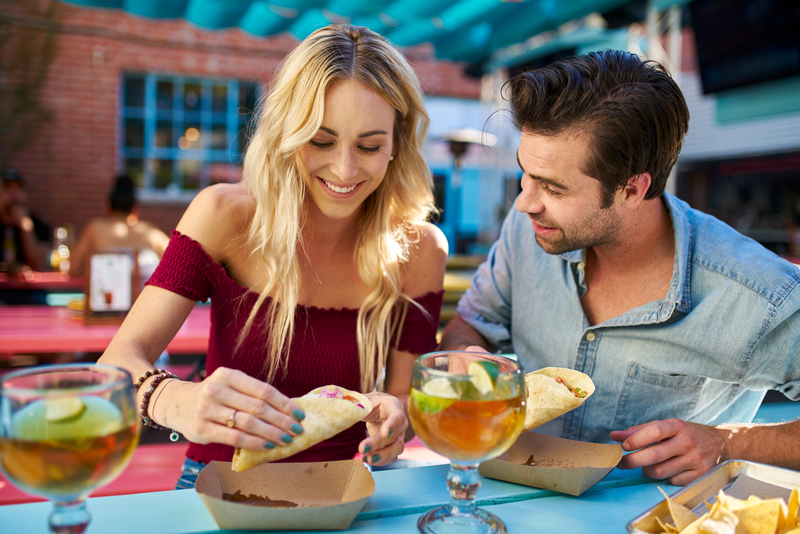 1000 Eaton St.
Garbo’s is located in an airstream behind a bungalow and serves up food-truck style meals including fish and shrimp tacos, Korean beef tacos, hot dogs and craft beer. It’s a casual lunch spot full of style and spice in Key West. 409 Caroline Street. We love the Fisherman’s Cafe’s for its fish sandwiches, burgers and wraps. Or try the island bowl, the fresh snapper or the generous portion of grits. Their biscuits and gravy can’t be beat at $4.99, and there’s plenty of opportunity to sit back and people watch while you enjoy your meal. 205 Elizabeth St.
For a break from seafood and Caribbean flavors, try Mam’s Israeli delights. Her creamy hummus, falafel, grilled chicken and shawarma come with all the fixings like tahini, pickles, pita and salad. The portions are generous and it’s all made with love. 405 Petronia St. When in the Keys, one must try conch, and the conch shack is the place to do it. From light and airy conch fritters to the cracked conch, lobster rolls and mahi mahi fish and chips, it all goes well with their frosty margaritas. The shack has low prices and fast service; great for lunch, dinner and late-night snacks. 118 Duval St. Enjoy a relaxed meal poolside at 24 North Hotel’s own Toasted Coconut restaurant, serving a range of fresh and tasty dishes at reasonable prices. Don’t miss the signature Toasted Punch cocktail and irresistible shrimp breaded in coconut flakes. Serving breakfast and a lunch/dinner menu, the drink list is also a sight to behold. 3820 North Roosevelt Blvd. Get your obligatory Cuban sandwich and more at Ana’s, a no-frills cafe where you order at the window and enjoy freshly made breakfast and lunch items at the outdoor picnic tables in a casual atmosphere. Reasonable prices and good food make it a local favorite. 1222 White St.
Key West is brimming with local flavor and eccentric charm, and these local eateries are a great way to get a taste of the local food scene without breaking the bank. Check out our latest specials and book your stay at 24 North - we offer continuous shuttle service into town and much more.